Under this proposed zoning, a new vape shop that sells smoke-free products would be unreasonably and unjustifiably prohibited from opening within 500 feet of a gas station, convenience store or tobacco shop that sells combustible tobacco products. This zoning essentially protects the sale of harmful products while restricting the greater availability of and easier access to safer alternatives! This action could easily have statewide consequences, so ALL Wisconsin vapers and vape shops who support smoke-free alternatives should take action NOW! Please keep sending emails and calling the Commissioners (see contact info below) and expressing your opposition to this ordinance! UPDATE 3/25/15: After several vapers and shops spoke at the March 23rd meeting, this ordinance was recessed until April 6th. (See video of March 23rd meeting here, starting at 01:38:00) NOTE: It was made clear that this ordinance would NOT impact existing businesses in their current location. Two Commissioners, Eric Sunderquist and Melissa Berger, requested further information on exactly how the zoning would impact the ability for new vapor shops to open, as well as to hear from the Mayor’s office as to the merits or rationale of singling out vapor shops for this type of zoning. They semed open to opposing this zoning. Alderman Steve King, who is apparently no fan of vapor products, quickly attempted to change the dialog, insisting that the next public hearing stay closed, to avoid any more discussion on the health debate. He insisted that was all settled during the indoor ban hearings and any new discussion should be limited to land use issues. In that light, it is imperative that vapers and store owners attempt to meet with and write the Commissioners (see contact list below) to express their opposition and insist that the City provide clear evidence supporting why e-cigarette sales should be treated in the same way as traditional cigarette sales AND why stand-alone shops selling vapor products should be treated differently than other retail stores and gas stations that sell vapor products. 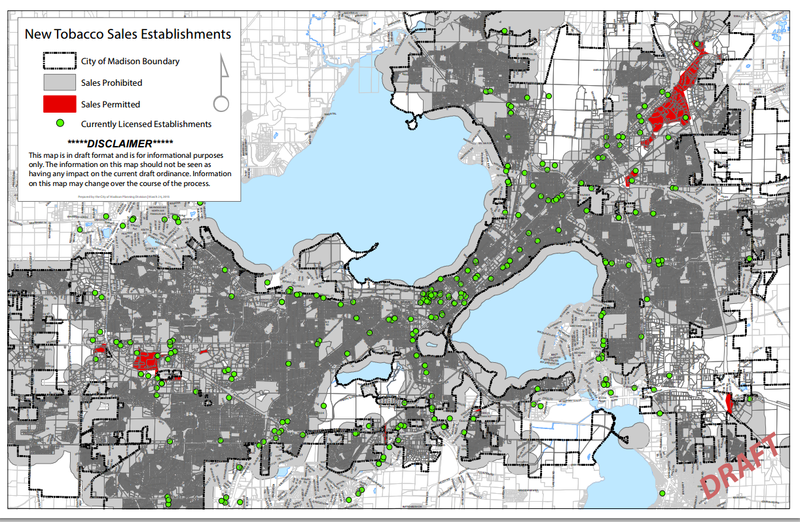 Areas in red show where new stores could open under the new zoning. The largest area would allow 2, maybe 3 shops at most. Others are only large enough for 1 shop. It is imperative that ALL Madison and Wisconsin e-cigarette shops, wholesalers and consumers oppose this ordinance, as this will set a precedent that will be used in other cities around the state! Note: Public Hearing items may be called at any time after the beginning of the public hearing. Those wishing to speak on an item must fill out a registration slip and give it to the Secretary. The Plan Commission uses a consent agenda, which means that the Commission can consider any item at 5:45 PM, where there are no registrants wishing to speak in opposition regardless of its placement on the agenda. A tobacco retailer is any establishment that either devotes twenty percent (20%) or more of floor area or display area to the sale or exchange of tobacco products or tobacco paraphernalia. Tobacco paraphernalia includes electronic cigarettes, personal vaporizers, electronic nicotine delivery systems, or any item designed to atomize liquid solutions that simulate smoking. Tobacco products includes e-liquids such as propylene glycol, glycerin, nicotine, flavorings, or other products for use in electronic cigarettes, personal vaporizers, or electronic nicotine delivery systems. This zoning would negatively impact businesses and jobs in Madison, severly limiting new business and expansion of existing businesses to new and secondary locations. There is no justification for restricting locations of vapor shops, when other stores that sell very similar products do not have the same restrictions. A zoning restriction that would forbid a vapor shop to be within 500 ft (approximately 1 1/2 city blocks) from a gas station selling cigarettes or a cigar store that sells only cigars makes no sense. Such a restriction makes deadly combustible products far more accessible to the public than low risk vapor products! Tell them how vapor products sold by vapor shops are an important part of your better health. Let them know how vapor shops are more responsible than other stores selling vapor products. Vapor shops are far more likely to ask for ID to avoid sales to minors and help smokers, compared to gas stations and other stores selling these products. If you own a store, tell them how your customers count and you for their supplies to keep from smoking. Have your customers write to the Commissioners, too! Take Action to Oppose this proposed zoning ordinance: Contact the Plan Commissioners! By kristinnollmarsh in Calls to Action, CTA, News on March 22, 2015 . Welcome to my world vapors, I’m certain that you feel that it is unpleasant to be stigmatised, to be a victim of legislation based on misleading information and in some cases outright lies. You have my sympathy to a degree, no human being should be treated the way the way the Tobacco Control Industry treats smokers and fully intends to treat you. You the Vapors chose to side with the Tobacco Control Industry, You chose to throw the smokers under the bus and now your friends in Tobacco Control have thrown you under the following bus, I am sorry that you have to learn by experience, especially when a large number of smokers would have supported you, some of us still would, some of us believe there is room for both smokers and vapors, that free market forces will support both and free market forces are something the Tobacco Control Industry oppose vehemently. Our mutual enemy is expanding, they are teaching anti alcohol and anti food lobbyists how to destroy all the things that bring us pleasure, the more fronts they open the more people will see what they have done to the smokers, are doing to vapors and will do to drinkers and lovers of good food. To beat Tobacco Control you need numbers, numbers who are willing to elect politicians who do not seek to destroy your pleasures, you need allies, if you want to win, I strongly recommend you seek them out before it is too late. Thank you for taking the time to comment. I am the founder of WSAC. You have one point very wrong, however. I don’t know one member of WSAC who has sided with Tobacco Control and “thrown smokers under the bus.” WSAC is not anti-tobacco nor anti-smoker. We view Tobaco Control as our greatest adversary and always have. Personally, I’ve been doing this for over 5 1/2 years and I’m very aware that smokers and vapers share a mutual enemy. I am quite aware that the same people now lying about e-cigarettes are the same people who lied about tobacco and second-hand smoke. We do not endorse smoking bans and we aren’t anti-tobacco – we only advocate for adults to have the truth about smoke-free tobacco products and for those products to be regulated fairly. You will never see WSAC leadership say something such as, “Ban tobacco cigarettes, but not vapor products.” What we say is, “Don’t ban vapor products,” without mentioning tobacco cigarettes. There are some vapers who still see tobacco and the tobacco industry as “evil” and still feel shame for smoking. I am not one of them and I will never allow WSAC to turn into something as bad as the Anti Nicotine and Tobacco Zealots (ANTZ), which is actually a term widely used by vaper that I coined. While I don’t actively fight for smokers’ rights (I have my hands full with WSAC and CASAA), you won’t see me, CASAA or WSAC ever support laws that persecute smokers. Thank you for your reply Kristin, and your correction regarding WSAC/CASAA. I fear the recent events with NOLA have not done the vaping community any favours and to a large degree influenced my line of thought and for that I do apologise. Like yourself I have been involved in the fight against the ANTZ and Governmental interference in private lives for some time, about 7 years here in the UK. I wish you well with your fight, when the day comes that anyone who does not fit into the healthist norm will be legislated against I look forward to a unification of all those who are legislated against with the aim of replacing those politicians who create such legislation. I find it incredibly ironic that a city such as Madison, long a bastion of free thinking and freedom in general, has stumbled on this issue of Vaping and facts concerning same. Not only are some of the city council members uninformed or misinformed as to the truth about Vaping and its health advantages, but their actions are taking away Madison’s citizen’s right to make an honest living. It’s a shameful day for Madison and I can only suspect there are ulterior motives behind those who are supporting this proposed ban on business. Time to take notes on who is pushing this legislation and vote them out next election. If they refuse to listen to reason now, that’s a good reason to not re-elect.